Goodreads says, "A thrilling reimagining of Shakespeare’s Hamlet, The Steep and Thorny Way tells the story of a murder most foul and the mighty power of love and acceptance in a state gone terribly rotten. 1920s Oregon is not a welcoming place for Hanalee Denney, the daughter of a white woman and an African-American man. She has almost no rights by law, and the Ku Klux Klan breeds fear and hatred in even Hanalee’s oldest friendships. Plus, her father, Hank Denney, died a year ago, hit by a drunk-driving teenager. Now her father’s killer is out of jail and back in town, and he claims that Hanalee’s father wasn’t killed by the accident at all but, instead, was poisoned by the doctor who looked after him—who happens to be Hanalee’s new stepfather. The only way for Hanalee to get the answers she needs is to ask Hank himself, a “haint” wandering the roads at night." Living in 1920s Oregon is especially hard for bi-racial Hanalee Denney. Her mother is white and her deceased father was African American. Her father, unfortunately, died when he was struck by a drunk driver. The drunk driver is a teenager and now he's out of jail. Everyone is telling Hanalee to stay away from him; after all, he did kill her father, but she is curious about what he has to say. He says that he isn't actually responsible for her father's death, but instead it's the doctor that looked after him. This doctor just so happens to be Hanalee's new stepfather! Obviously this blows Hanalee's mind; she realizes she has no choice other than to ask her father herself as many people have reported his ghost wanders the street where he died. To make matters worse, the KKK is prevalent in town, there's bootleggers, and racial tension...all this lead to major complications for Hanalee. The Steep and Thorny Way by Cat Winters is a suspenseful murder mystery as well as a glimpse into what life would have been like for a bi-racial teenager living in the 1920s. Fans of historical fiction will appreciate this story the most. 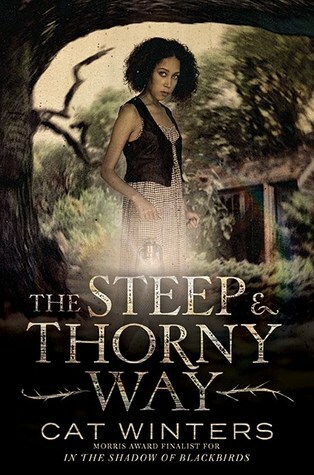 I really enjoyed the character of Hanalee in The Steep and Thorny Way; my heart went out to her when she had to deal with the small-minded townspeople. Whether it was because she wasn't allowed in a particular restaurant, or because her skin was too dark, or because she, essentially, has no rights, it all made me feel sympathetic towards her plight. Things become really crazy when she starts suspecting her stepfather as her father's killer and that's when the murder mystery takes flight. Winters does, as usual, a great job bringing the time period to life. This is what she does best. You can easily tell how well-researched The Steep and Thorny Way is and I loved that every few chapters included actual photographs from the time period. That definitely added to the authenticity of the novel as well as the atmosphere. This story, although it's historical fiction, definitely has a ghost-story like feel (since she communicates with her dead father) and Winters really keeps things suspenseful. The time period of the novel also reminded me a bit of Boardwalk Empire, which Winters says influenced the story. I was hoping for some more romance in The Steep and Thorny Way, so if that's what you are looking for, look elsewhere. This story is strictly a historical read/murder mystery with some paranormal elements. It's also loosely based on Hamlet, which was also a nice touch. Fans of the time period as well as Cat Winters will enjoy this novel. Thanks to Amulet Books, I have an ARC of this novel give away to one lucky US reader. Please refer to my giveaway rules and the deadline is March 30, 2016. Good luck! I hadn't heard of this before but it sounds really interesting. I think the historical aspect really appeals to me though I also enjoy a good murder mystery. Hamlet is one of my favorite Shakespeare plays and while this doesn't appear to be a retelling, I may just have to give it a try after reading your review. Thanks for putting this on my radar! Yes, it loosely based on Hamlet, so don't expect a really strong retelling, but I can see the similarities for sure. I definitely liked the historical aspects of the story and the authentic pictures form the time-period. It was a nice touch. Thanks for visiting, Christina! Sounds like a perfect read for you then! You'll enjoy the historical details. Thanks for visiting!